As a followup to my recent posting about interactive experiences (or lack thereof) in art museums, I thought I'd share two different points of view about the "reinvention" of The Detroit Institute of Arts (or the DIA as it's known to locals.) For context, the DIA has reopened last year after completely reconfiguring its galleries and its institutional approach toward the visitor experience. 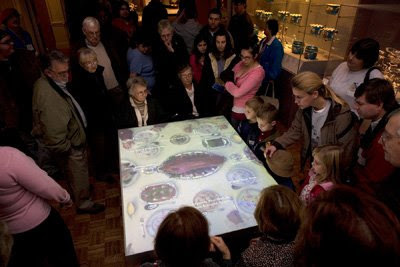 The first (immediately below) is a report from the radio show Studio 360 that details an interactive "virtual dining" experience that serves to highlight some of the DIA's decorative arts collection. Personally, as someone who was born and raised in Detroit --- I count the DIA as one of my favorite museums --- I can't wait to get back to Detroit to see the "new" DIA. The dining interactive sounds like a wonderful way to engage visitors in a difficult, but interesting, area of the collection. Clearly not everyone feels the same way. Enter art historian Christina Hill, who wrote this opinion piece for one of Detroit's alternative newspapers, The Metro Times. Ms. Hill comes off as a bit of an art snob, in my opinion. As an art historian she may well have the education and experience to take away "volumes" of information from every encounter with a work of art, but I doubt that every visitor (or potential visitor) to an art museum has the same capacity. I'm at a loss to see the downside of thoughtfully integrated interactives in an art museum. What do you think? Should art museums remain purely temples to art? Are interactives in an art museum condescending to the primary audince? Are interactives just a "cheap trick" or do they "dumb down" the primary experience? Add your own thoughts in the "Comments" section below. I'm the public relations director for the Detroit Institute of Arts, and thought you might be interested to know that Christina Hill's article was written in Jan. 2007, before she had seen the new interactive elements in place. I took her through the museumm once everything was installed, and she completely changed her opinion. We have gotten an overwhelmingly positive reaction to our "high-tech interactives" from the public, media, and art scholars. The "dumbing down" comments were made by those who hadn't seen the new DIA. Several of those who made such comments also changed their minds once they visited the museum and experienced the new interpretive elements in context. I'd be happy to show you around the DIA the next time you're in Detroit. I would interested in your reaction. Now I have an added incentive to visit the DIA next time I'm visiting family in Detroit! Did Christina Hill update her original piece? If you send me a link, I'd be happy to update this posting. I was so glad to read that Ms. Hill revised her opinion. I just read her article in the Metro Times, and was very upset by her elitist and close-minded thinking. I am a museum professional, and I applaud the DIA for setting the trends that will define art museums of the 21st century. The rest of the world is watching and delighting in your successes! Although I do not live in Detroit, I am a member of the institution and I eagerly anticipate Graham Beal's columns in the member newsletter. What a refreshing voice for the future of art museums! Bravo, DIA! I can't wait to visit you when I am in Detroit later this month! The Mattatuck Museum in Waterbury, CT, has recently opened a new, long-term history exhibition that features an interactive touch-screen like this. In Waterbury, it is known as a "Community Conversations Table". Here the interactive is at the end of the exhibit and allows visitors to take a stand on current issues facing the region today. They can run for election, building their platform on material in the exhibit and can win election based on the votes of other visitors. Photos of visitors instantly appear on the surface of table and become election posters. I love seeing the technology in use at an art museum like the DIA--allowing the decorative arts collection to come to life! Thanks!